ABOARD THE VIKING VILHJALM — Early in the morning, my Viking Longship arrived in Krems, a small Austrian village on the banks of the Danube. Red roofs, a bulbous turret and a yellow clock tower rising above the town greeted us. Viking cruises offers an exclusive visit to the Benedictine Abbey of Göttweig, a working monastery that’s been in existence for more than 900 years. 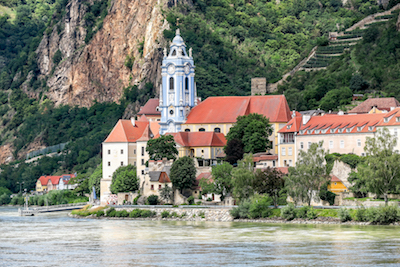 The monks live, work and worship from a hilltop overlooking postcard-pretty Wachau Valley. Welcomed into the abbey’s flourishing apricot garden, we began with a taste of locally produced sparkling apricot wine. A short film about monastic life followed, exclusive to Viking guests, explaining what it takes to run a monastery today. We then crossed the abbey’s central courtyard, past a cluster of buildings topped with onion-shaped domes, and into the abbey’s museum. A variety of displays chronicle the history of the Augustine shrine and its role as a monastic retreat. The Benedictines arrived in 1094, a fire destroyed their castle in 1718, and it was rebuilt a few years later. The Nazis confiscated much of the artwork during World War II. After the war, the monastery housed 3,000 Russian soldiers. Today, it reigns in peace, back to its intended purpose. Like some other abbeys in the region, Göttweig included imperial wing (an incredibly upscaled kind of travelers rest for past royals). 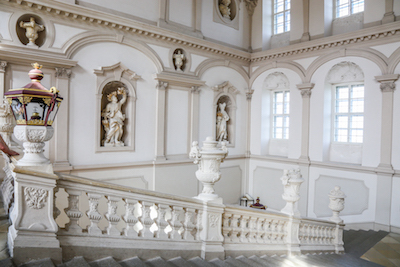 I didn’t expect to find a dazzling white-on-white three-story Baroque staircase in a monastery. One of the largest and most spectacular ceiling frescoes in the world crowns the ceiling, depicting the Holy Roman Emperor Charles VI as Apollo. Reaching the top of the stairs, we found many works of art and more of the abbey’s treasures. Then came free time to explore the cathedral and its rainbow-colored interior. A curious gathering cut our time in the cathedral short – – dozens of motorcycles had roared onto the grounds for a blessing, certainly one of the oddest I’ve seen. Down in the abbey’s cellars we had a taste of several wines from the monastery’s vineyard. 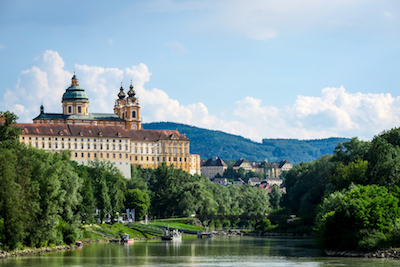 Then, we hustled back to the bus – – set for ride to another abbey, this one at Melk. Believe it or not, one of the joys of this tour was the bus ride. We passed through towns so tiny that the narrow roads just barely allowed the bus a little “squeeze” room. Other fairytale-like villages and ruins of castles dotted the opposite riverbanks and clung to its dramatic hillsides. Our guide’s insightful explanations offered an understanding of the area that would come in handy during the coming afternoon’s cruise. We crossed a bridge then rode uphill to mustard-colored Melk, standing high above the Danube. Here, we joined an official abbey guide, passing through chronologically arranged rooms tracing its history. Because of its proximity to the royal court, the monastery built extensive royal apartments – seems like the monarchy must have had its own early hotel chain in these parts. Of course, a banqueting room was also necessary. This hall’s columns looked like marble, but were faux, painted to look like the real thing. The ceiling fresco also fooled the eye with trompe l’oeil effects giving the appearance of great height. The library remains Melk’s foremost treasure. It is lined floor to ceiling with dark bound volumes. The 100,000-book and manuscript collection includes a ninth-century manuscript, rare collections and lots of gold accents. The abbey owned a copy of one of the original Gutenberg Bibles, but it went to Yale in a sale to fund needed roof repairs. The adjoining church, another area used by the royal household, is a Baroque gilded jewel box. I thought it looked like someone poured liquid gold over the interior, freezing it in place. If the purpose of Baroque is to overwhelm the viewer, the Melk church succeeds. I found the golden touches dazzling, but too extravagant. However, the abbey remains a joy to behold, a kaleidoscope of brilliant color, and I’m glad I visited. combination of terraced vineyard slopes, dry stonewalls, hillside castles, and riverbank villages. We passed the Wedgewood blue and white towering confection of Durnstein, the steeple belongs to the monastery. Locals are not happy about the recent change to this color palate, but so it remains. Above Durnstein, the rocky remains of the 12th-century Kunringer castle loom. It was near here that Richard the Lion-Hearted, disguised as a peasant, was captured. He was reportedly imprisoned in the castle by Leopold V of Austria and paid a ransom for his release a few months later. I found Spitz another attractive town, framed between the Danube and fruit trees and vineyards. Spitz boasts a “thousand bucket hill,” an area known to produce enough grapes for a thousand buckets of wine (12,000 gallons). The enchanting panorama provides a photographer’s delight and memorable vista all will enjoy. After dinner, we joined a rousing round of group trivia participants and retired early. Tomorrow would be a daylong excursion to Cesky Krumlov in the Czech Republic.